Make the short climb to the rim of this extinct volcanic crater for spectacular views of Honolulu, the Pacific Ocean and the rugged ranges of Oahu’s interior. The curving green slopes of Diamond Head dominate the Honolulu skyline, a stunning backdrop that has become an iconic Hawaiian scene. Hike the 0.75-mile (1.1-kilometer) trail to the top, or simply enjoy a picnic at its base. Known by locals as Le’ahi (brow of the tuna), Diamond Head is an extinct volcanic crater, a “tuff cone.” The circular mountain formation was shaped around 150,000 years ago by a short, intense eruption. With its rim at 760 feet (228 meters) above sea level, it’s the perfect height to be both a relatively easy climb and an excellent lookout point. 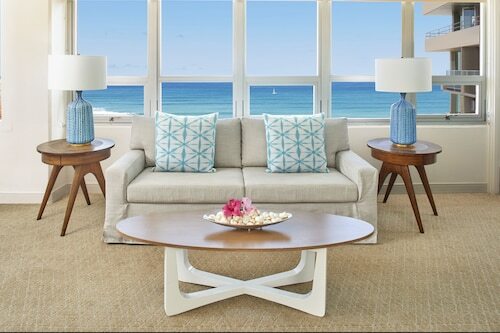 Enjoy exceptional views of the now overgrown crater, Oahu island and Honolulu’s coastline. Follow the handrails and the informative signs all the way to the top. A walk along an unpaved path and over lava leads to some tunnels and staircases and, finally, the observation platform. 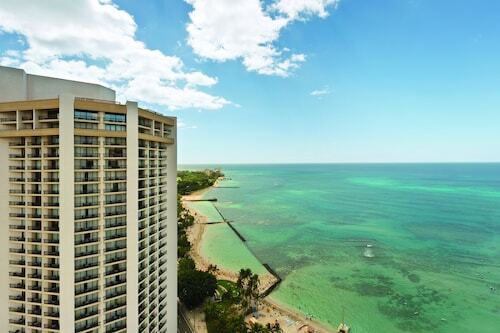 Cool off in the sea breeze and take in some of the best views in Hawaii, with Waikiki Beach and Kapiolani Park directly below you and the Pacific Ocean stretching to the horizon. Take pictures of the lighthouse, or, if you are there in winter, of the breaching humpback whales that often migrate past this point. The 475-acre (192-hectare) Diamond Head State Monument area at the mountain’s base has picnic tables and benches, where you can enjoy your packed lunch. Alternatively, try one of the many eateries along Monsarrat Avenue, just opposite the entrance. Visit on Saturday mornings for the local farmers’ market and buy fresh, local produce or tasty snacks. The Diamond Head trail starts just beyond the entrance to the Diamond Head State Monument, on the coast east of Waikiki. You can get to the park on foot, by bus or car, and it opens from early morning to late afternoon. There is only a small charge for entering. The climb is steep and over an unpaved path, so wear good walking shoes. Also bring water, a torch for the tunnels and sun protection. Allow 1–2 hours for the hike. Take a look at our Honolulu things to do page to learn about many more activities while you're here. Head to the top of one of Hawai’i’s most iconic buildings for remarkable bird’s-eye views of Honolulu on one side and the ocean on the other. A visit to this famous Honolulu landmark with a captivating history puts you right in the center of the action, with must-see sights every way you turn. What began as the exotic bird collection of the island’s king is now a park with over 1,200 animals, including several rare and endangered species. Jog or walk the trails, play tennis or relax beneath the shade of an ancient banyan tree in Hawaii’s oldest public park, with a stunning volcanic backdrop. Learn about one of the most tragic days in America’s history, and pay your respects to the sailors who lost their lives, at this Pearl Harbor memorial. Pack your shorts or bikini and surf, swim, or just sit back under a palm tree and enjoy the Aloha spirit at Hawaii’s most famous beach. Enjoy the sun, sea and sand at one of Hawaii’s best swimming and surfing spots, a popular nature escape within easy reach of downtown Honolulu. More than 400 fish species and green sea turtles live in this marine ecosystem at one of the best snorkeling spots in Hawaii. Visit historic Pearl Harbor and step aboard an old war ship to see how the brave soldiers lived and served beneath the sea to avenge the Japanese attacks. From lava flows to a whale skeleton and the regalia of ancient royalty, you’ll find aspects of Hawaii’s unique heritage on display at this gallery with planetarium. The picture-perfect location of one of Hollywood’s greatest love scenes is an idyllic place for a romantic stroll, a refreshing swim or a leisurely picnic. Located on the south shore of Honolulu, this neighborhood is known internationally for its great surfing and beautiful beaches. Discover the triumphs and tragedies of the Hawaiian royal family and see their jewels, living quarters and more in Hawaii’s royal palace. With just-right waves and refreshing breezes, this is one of the best beaches on O’ahu to learn how to windsurf or kitesurf. Take a hike through the lush Hawaiian rainforest to discover a wealth of flora and Oahu’s most impressive waterfall. The picture-perfect location for one of Hollywood’s most famous love scenes makes a great place for a romantic day trip or a family picnic. 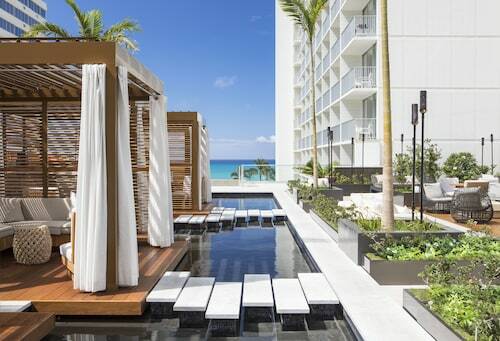 Park Shore Waikiki is located fronting Waikiki Beach and iconic Diamond Head. 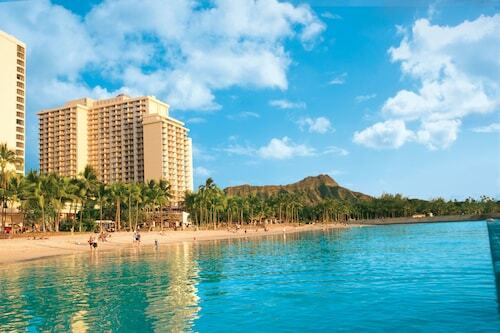 The Honolulu Zoo, Kapiolani Park and the Waikiki Aquarium are each a short walking distance from the hotel. 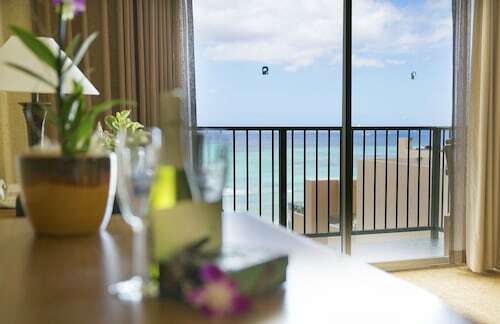 Located in the middle of Waikiki, this beachfront Outrigger hotel is close to water sports, shops, and restaurants, and a short walk from a zoo, aquarium, and park. 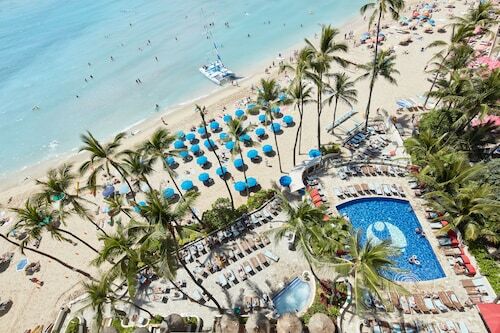 One block away from the world famous Waikiki beach with calm ocean waters and endless water activities, this island-style hotel is 4 blocks from Kapiolani Park and about 4 miles from downtown Honolulu.